What does your dream kitchen look like? Does it include custom cabinetry? How would you like to get a little closer to that ideal with a fresh, updated kitchen look? The good news is that you can do it without breaking the bank. Professional handyman service can update your greater Cincinnati area kitchen with designer details on a budget. You can opt to change the whole design aesthetic or just add some stylish nuances to customize your cabinets and counters. 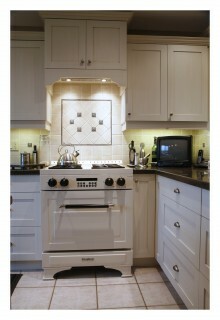 Enjoy a budget-friendly, kitchen re-do without the inconvenience and expense of a full remodel. Decorative supports: Emphasize upper cabinets with an artful touch. Supports come in numerous sizes and styles to accentuate cabinets and add flair. Valances: We often install valances over the stove to hide exhaust fans. Cover up lighting or electrical components visible around your kitchen island or countertop, or just add decor. Choose shapes and styles to fit any design—from country-style or traditional to contemporary or minimalist. Aprons: You’re not the only one who needs an apron in the kitchen! Add a distinctive, custom apron that runs under and around your countertop’s overhang. Legs: Legs are a great touch to dress up your center island’s corners, partnered with the style of the apron. Feet: Cap off the counter’s legs with decorative feet. Feet can be fitted and adhered under a toe kick. Add them to one central cabinet or to the base of the sink or cooktop area to create a look of built-in custom furniture. Toe kicks: You may have seen these industry-standard details on modern kitchens on TV cooking shows. They offer comfort for your feet, protecting toes and furniture when you (or the kids) are near doors or the counter. Add character to your kitchen with custom cabinetry without busting your budget! Contact the home comfort experts at Apollo Home Handyman Services. We’re part of the full-service Apollo Home Heating, Cooling and Plumbing company. Tell us what you’re looking for or get ideas from our kitchen-updating experts. Contact us today!